"In the beginning God created the heaven and the earth. And the earth was without form and void; and darkness was upon the face of the deep. And the Spirit of God moved upon the face of the waters. And God said, Let there be light; and there was light." Thus it was that at the humble beginnings of Pythagorean Lodge, here in Marion, there had been Masonic darkness up to 1861. However, a group of determined and dedicated men changed that bleak picture. They brought the light of Masonry to Marion in due form; which due form was in the organization of Pythagorean Lodge, under dispensation from the Most Worshipful Grand Lodge of Massachusetts just one hundred years ago. You will remember, my Brothers, that on a certain memorable occasion centuries ago the great Pythagoras exclaimed, Eureka, signifying in the Grecian language, "I have found it." Thus our early Brethren chose the name "Pythagorean" for their newly-constituted Masonic Ixidge, to which a regular charter was granted in 1863. Our records show nothing unusual from 1861 until 1905, as out-long-time friend and Brother, Worshipful Fred B. Barden, the honorary chairman of this centennial celebration, said in his speech in 1937 on the occasion of the burning of the mortgage on our present Masonic edifice. At that time (1905) it appears that a new generation of men seeking light sought and gained admission into the Pythagorean Lodge. Wor. Brother Barden himself was raised to the sublime degree of Master Mason in that year. The Lodge at that period met in comparatively small quarters over a country store at what we call the Upper Landing, where sea-going ships used to berth. Access to the Lodge was gained by means of an outside stairway. The furnishings were extremely plain and simple; even the officers' chairs were homemade. But the members were imbued with the true spirit of Masonry and subscribed themselves wholeheartedly to "the most excellent tenets of our profession; friendship, morality and brotherly love." So it was that by 1908 all the Brethren of our Lodge were deeply conscious of the pressing need for more suitable apartments in which to teach the virtues of Masonry to yet more men desiring light in this sense. In that year the cornerstone of our present edifice was laid with appropriate ceremonies. The financial assets of the Lodge were then less than $300.00. Nevertheless, its intangible assets being immeasurable, this building was completed in 1911 at a cost of approximately $22,000.00. In less than one year $18,000.00 was raised by public subscription. There was a mortgage which was steadily amortized until, in 1937, it was wiped out completely. Since that date, 24 years ago, Pythagorean Lodge has had a home entirely free from any encumbrance. We today owe a debt of gratitude to the membership and officers of those days, many of whom are still active in the Lodge. That debt can never be paid in money and that is very likely the way that they would like to leave it. The total membership of the Lodge is now 205. In recent years we have been fortunate in gaining many new members from Mattapoisett, and we have also obtained many new Brothers by the process of affiliation. Generations change, however, and we realize fully that we must never relax our diligence in promoting the interests of our beloved fraternity so that it may impart the secrets of Masonry to men yet unborn. It is with a feeling of real accomplishment that we arrive tonight at our centennial milestone, accompanied as it is with a deep feeling of gratitude and esteem for the long line of Brothers — Masters and laborers in the vineyard — who have made it all possible. No history of any Lodge would be complete, in my opinion, without paying tribute to the steady, unremitting devotion of the hundreds of dedicated Masons, past and present, in our membership who are almost never in the limelight, but whose regular attendance, payment of dues and faithful interest in Lodge affairs keep the light of Masonry burning brightly. Therefore, Pythagorean Lodge does hereby publicly render tribute to these faithful Brethren, as well as to our four Brothers who were honored by appointment as District Deputy Grand Masters by the Grand Lodge of Massachusetts in the last fifty years. Now, as we enter upon our second century of teaching and using the principles of Masonry, we have unswerving faith that the Supreme Architect of the Universe will continue to guide us truly in our path here on earth as He has guided Pythagorean Lodge for the past one hundred years — and to Him shall be all the glory and the praise forever. Pythagorean Lodge, at Marion, in the county of Plymouth, was constituted, and its officers were installed, "according to ancient usage," on the 14th ultimo. The ceremonies were performed by the M. W. Grand Master, assisted by the competent number of Grand Officers, in a very able and satisfactory manner. At the installation of the officers the doors of the Lodge-room were thrown open to the admission of the ladies of the village, and a large number availed themselves of the privilege, and for the first time witnessed a Masonic ceremony. They seemed to be well pleased with what they saw and heard, as the Brethren were by their presence. The Hall has been neatly and safely fitted up, and the members of the Lodge are confident in their ability to sustain it. Wc wish them all the success and happiness in their new undertaking which they can reasonably hope for and expect to realize. 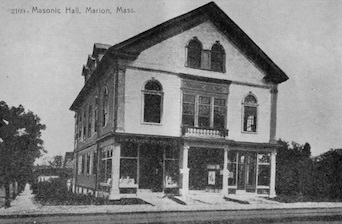 No event in the Masonic history of Marion, Massachusetts, has ever equalled in interest, or in promise of continued pleasure and future benefit, the dedication of the new Masonic home of Pythagorean lodge by the Grand Master and officers of the Grand Lodge, Tuesday, October 31, 1911. The interest of the occasion was not confined to the local lodge. Brethren came in great numbers from all the surrounding towns to join in celebrating the happy event and to wish for Pythagorean lodge a career of increased prosperity and usefulness commensurate with its handsome and commodious new home. The number of visitors was so large as to tax the capacity of the large hall to its limit. There were 70 members from George H. Taber Lodge of Fair Haven, also the officers of Star in the East and Eureka Lodges of New Bedford; others came from Wareham, Fall River and Taunton. An inspection of the building was made during the day and it was found yo be admirably adapted to the needs ot the lodge. On the ground floor of the new building there are two large stores. The approach to the second floor is gained by a wide entrance in the centre of the building, on either side being panels in mosaic of Masonic emblems, while the entrance is finished mosaic with the words Pythagorean Lodge A. F. and A. M. and 1863-1911, these being the dates of the granting of the charter and the dedication. The second floor includes a large coat room, smoking room, reception room, candidates' room and the lodge room. The lodge room has been finished with exceptional taste, and the furnishings and colorings have been selected with such care that the whole presents a very beautiful appearance. The electrical equipment is of the best and can be used with good effect in the work of the lodge. The third floor comprises kitchen, large banquet hall and two coat and storage rooms. A splendid heating and ventilating system with electric fan are features which add very much to the equipment. The total cost of the land, building and the equipment is over $20,000, and the lodge is greatly indebted to one of its members, Col. H. E. Converse, who has given one-third of this amount. Among those who have been active in the promotion of the building enterprise are the following: Building committee, Past Masters Dr. Alger W. Rice, George S. Briggs and William A. Andrew; finance committee, F. B. Barden, W. M., Past Masters George H. Brown, Nathan C. Hamblin, William A. Andrew; and Walton S. Delano, Walter K. Perry, Francis Whitworth, Charles E. Hellier, E. F. Ashley, A. L. Pierce, F. M. Patten, G. C. Sabins and Richard W. Clark; furnishing committee, F. S. Barden, W. M., Herbert Austin and Rev. H. L. Brickett; committee on dedication, Col. H. E. Converse, F. B. Barden, Herbert Austin, Capt. George H. Brown, George C. Sabins and Rev. H. L. Brickett. Trustees, Col. Harry E. Converse, Herbert Austin and R. W. Clark. The officers and members of the Grand Lodge, who conducted the dedicatory services, were: Most Worshipful Dana J. Flanders, Grand Master; Rt. Wor. William H. L. Odell, as Deputy Grand Master; Rt. Wor. Samuel Hauser, Senior Grand Warden; Rt. Wor. James L. Sherman, Junior Grand Warden; Rt. Wor. William H. H. Soule and Rt. Wor. George H. Rhodes, past Grand Wardens; Rt. Wor. Charles H. Ramsay, Grand Treasurer; Rt. Wor. Thomas W. Davis, Recording Grand Secretary; District Deputy Grand Masters Frank T. Barron and Charles T. C. Whitcomb of the Third and Thirty-First Districts respectively; Rev. R. Perry Bush, D. D., grand chaplain; Wor. Harry P. Ballard, Grand Marshal; Wor. Roscoe E. Learned and Wor. Olin D. Dickerman, Grand Deacons and Wor. B. Wesley Brown as Grand Tyler. The presence of the grand officers was announced and they were escorted to the lodge room by the following committee: Wor. George H. Brown, Wor. George I. Luce, Wor. William A. Andrew, Wor. Captain R. R. Chase, Joseph W. Briggs and John W. Delano. The program follows: Reception of the Grand Master, Most Wor. Dana J. Flanders and suite; Praise Ye The Father, Quartette; Prayer by Grand Chaplain, Wor. Rev. R. Perry Bush, D. D.; Response, Quartette; Surrender of the Working Tools, Wor. Dr. A. W. Rice, chairman Building Committee; Address to Grand Master, Wor. Frederick B. Barden; Reply, The Grand Master; Examination of the building by the grand officers, Ceremonial Dedication to Freemasonry, Ceremonial Dedication to Virtue, Ceremonial Dedication to Universal Benevolence; Invocation by the Grand Chaplain, Proclamation by the Grand Chaplain; Proclamation by the Grand Marshal, Wor. Harry P. Ballard; To Thee All Praise Be Given, Quartette; Dedication Poem, The Temple, Bro. Rev. H. L. Brickett; Dedication Hymn— Hail, Sacred Fane. Benediction. Laid out in perfect "square;"
To these your thoughts we bring. Had built in faith and prayer. Though full his heart of praise. That nought the work debar. Whose fame the world has filled. To be the craftsmen's leader. Nor did the work relax. A joy to passers by. And pomegranates by the score. As Nature works in the tree. And Beauty the branches free. Honored the living and dead. In Him, whose name is Love. For service good and true. The Ark and Aaron's rod. He comes, the King, to stay. In the lodge that we call "Blue." "On the level" you have trod. Your earthly house build "square" and "plumb,"
When He with glory filled her. With mind, and heart and hand. To dwell in glory there. To bid us each "arise." Following the programme a collation which was provided by Colonel Converse was served by the ladies of Atcyone chapter, O. E. S. The company then reassembled in the hall. Remarks were made by F. B. Barden, W. M., who referred to the generosity of Colonel Converse and others. The colonel was given three cheers by the company. Remarks were also made by Dana J. Flanders, G. M.; Samuel Hauser, S. G. W.; Grand Chaplain Dr. R. Perry Bush; Dist. Deputy Grand Master C. P. C. Whitcomb, and William A. Andrews. The latter paid a tribute to the late treasurer and master, Frank B. Coggershall. Brother Herbert Austin, a member of Pythagorean Lodge and an active member of several Masonic bodies of Boston, took advantage of this occasion to entertain a number of prominent Scottish Rite brethren among whom were: Henry N. Fisher, Eugene A. Holton, Joseph W. Work, George C. Thacher, and Joseph A. Bryant. Each of whom express a very high opinion of Marion Masonic hospitality. The present officers of Pythagorean lodge are: Frederick B. Barden, Worshipful Master; John Allanach, Senior Warden; James H. Morss, Junior Warden; William A. Andrew, Treasurer; Albert C. Vose, M. D., Secretary; Daniel Gallienne, Chaplain; Francis Whitworth, Marshal; George C. Sabins and Thomas A. Oglesby, Deacons; Chester A. Vose and Bismark Lander, Stewards; Edward F. Ashley, Inside Sentinel; Horace M. Humphrey, Organist and James Watson, Tyler. The lodge has had twenty Worshipful Masters previous to the present Master of this number eight are living.